Top Rent A Car presents to the attention of its current and future customers, the new option Top Xpress. With this new service, our customers will be able to save time when pick up the rented car because the data they entered there will be filled up in advance in the contract. Top Xpress can be selected either during the booking process (step 3) or after it. 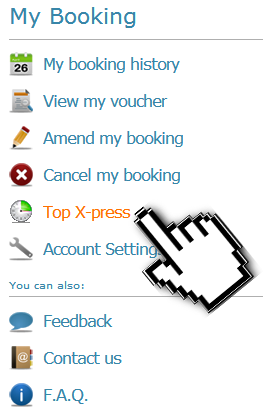 If you forget to enter your data, you may do so after logging into your My Top account and enter your data in Top Xpress menu. Our new service is customers oriented. You can push up the process for car hire in Bulgaria and it will reduce the inconvenience of waiting and the queues. And we know that nobody want to wait on a queue 🙂Once filled up, customer’s data is kept and there will be no need to be reentered every time when booking a car. In case of changes, every customer will be able to correct the information himself. Did you take advantage of our new service?